Day 7 began with breakfast at the Grand Hotel San Marino followed by our departure to Florence, which was originally scheduled for 10 a.m. However, we encountered some difficulties while trying to load our luggage on the bus, which delayed our departure. We have now been in Italy for six full days, and please recall the number of times we have mentioned in these daily recaps “a little time to sightsee and shop on our own.” Everyone on the trip, players and staff alike, appears to have taken full advantage of his and her shopping time, as we have accumulated significantly more luggage than we had when we started the trip. The extra luggage makes loading the bus more difficult, as it must be packed in a precise and organized fashion in order for everyone’s bags to fit. Not only that, but San Marino has very narrow streets, and when a large tour bus is parked in the street in front of a hotel, there is BARELY enough room for a passing car to fit between the bus and the row of parked cars on the other side of the street. So, the amount of time that was required to load the bus equaled the amount of time that traffic had to be slowed and/or stopped along the street, which is the only way to travel (by car) to the top of San Marino. As you can also probably imagine, having their morning traffic patterns altered by our bus did not make some drivers very happy. Anyways, it took almost an hour, there were some angry drivers and one irate local business owner, and our bus driver, Emilio, was definitely a bit stressed, but with the help of Video Coordinator Darian Riley and Academic Advisor Ramy Mosbah directing traffic, we finally managed to load the bus and depart San Marino. Once we arrived in Florence, we had time for a quick lunch on our own before meeting for our walking tour of the city. We started at the Galleria dell’Accademia Museum, which houses Michelangelo’s David. 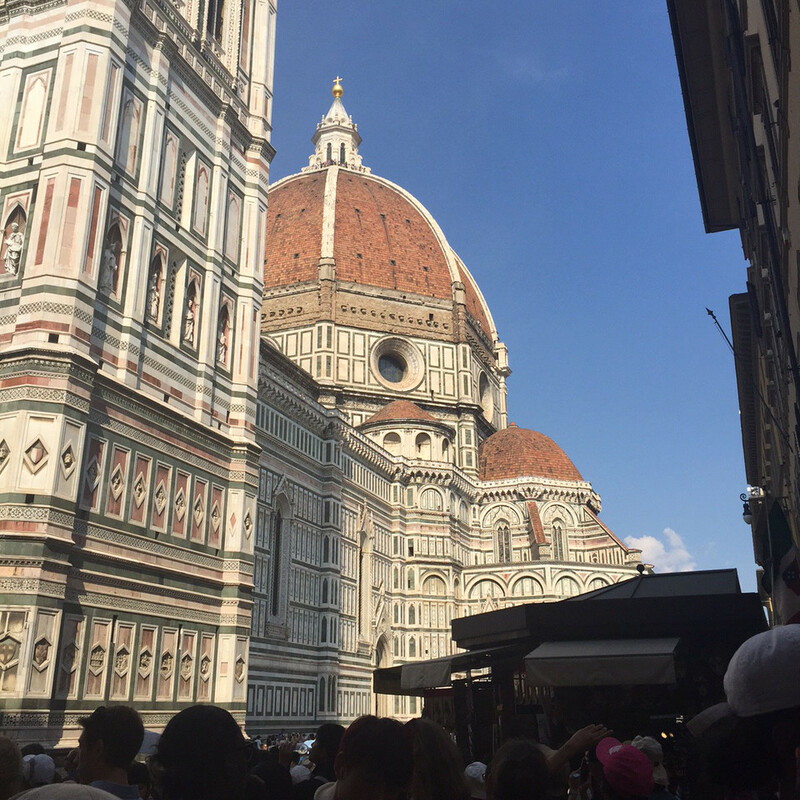 Next, we walked to the Duomo of Florence (also known as the Cattedrale di Santa Maria del Fiore), which is the fourth-largest cathedral in the world. After we visit Vatican City on Thursday, we will all be able say that we have seen three of the four largest churches in the world. (The third-largest is the Duomo in Milan, which we saw on our first day in Italy.) Our walking tour concluded at the famous Ponte Vecchio bridge. After checking into the hotel, we walked right back to the city center for some shopping, followed by dinner. Florence is known for leather, and there were many purses, wallets, belts and satchels purchased by members of our group. (If Emilio is reading this, he’s probably already getting worried about the additional luggage.) I guess we’ll find out if everything fits on Wednesday morning when we pack up and head to Rome for the final two days of our Italian adventure!